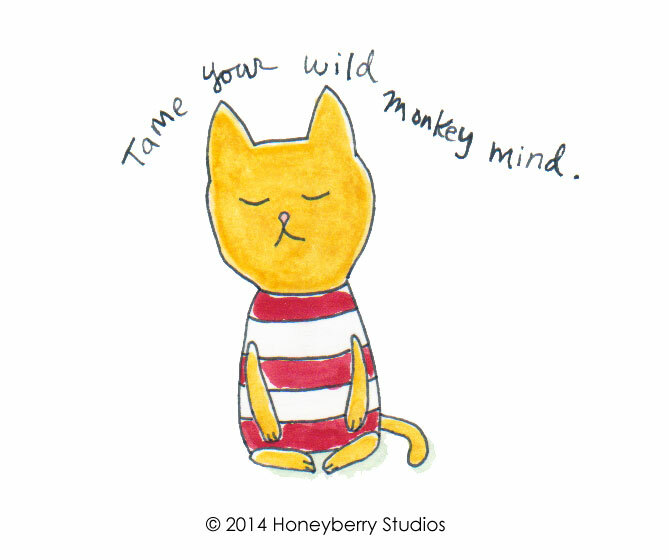 Taming Your Wild Monkey Mind! It has been a year since I went to my first Vipassana 10-day silent meditation retreat here in Washington. When I first heard about the Vipassana retreat, I was a little overwhelmed. Not speaking and meditate for 10 days!? WOW! I’m naturally a curious person, and last year, I somehow felt I was ready. What is the worst that could happen? Even if it sucked, it would be over in 10 days. So there I was without any big expectations, my clothes and sleeping gear in a little suitcase, I rolled up in my 2000 Honda Civic at the meditation center in the rural Washington. I had done some meditation practice in the past but never seriously in any way. We checked in, moved in to the dorm room, met my room mate, and had a delicious dinner with the fellow students on the first night (and we could still talk & socialize at this time). Our practice began on the first night. We were assigned our sitting spot in a big hall. The meditation practice was lead by the video and audio recordings of Mr. Goenka, and teachers were also available for questions. From this point on, you’re to focus on your practice and have no interaction with your fellow students. No talking, miming, writing, eye-contact or body language. You’re only allowed to speak to the manager and the teacher if you need assistance with your accommodation or the practice. I know this is kind of overwhelming, but as an introvert, I was also looking forward to not talking to anyone for 10 days. No need to strike up a conversation with strangers and make small talks. How relaxing! During the 10-day retreat, your daily routine is pretty structured. Your day starts at 4am, and meditate for a couple of hours. Breakfast is served at 6:30am. Then you meditate for a few more hours. Lunch at 11am, and you will have a little break to rest and/or walk along the path in the property. You meditate again for the afternoon, and instead of dinner, we have tea with honey and milk and some fruits at 5pm. After dinner, we have more meditation and discourse/lecture until 9pm. Then lights out at 10pm. I was a little worried about the “no dinner” situation as I LOVE to eat. Though it was hard in the beginning, I got used to it eventually. Because we just sit for the most part of the day, I didn’t get super hungry anyway. And their food was really great too. Healthy, wholesome vegetarian meals were prepared by awesome volunteers every day. 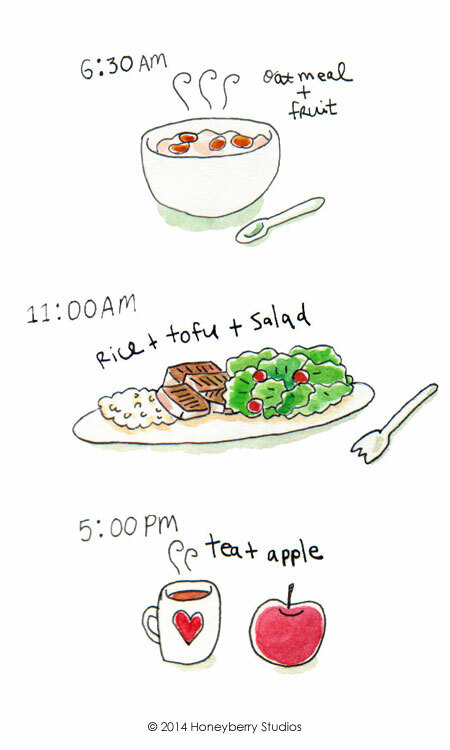 This is what a typical day’s meals look like. So, during the retreat you would sit and meditate for about 10 hours per day either as a group or individually in your room. Each day, we’re given instructions and guidance to further our practice. In the evening, we’ll watch the video-recording of Mr. Goenka’s lecture, and I looked forward to that every day. He is quite a character, and I felt like he knew what I was thinking a lot of the time. Questions like, “Why am I here?” “Why are we doing this silly nose breathing thing day in and day out? ?” were answered during the video lecture. The program was well structured so you are able to build on a skill and really learn to sharpen your senses. Sitting for a long time was definitely not easy, but by far the hardest part for me was shutting off my mind. As Mr. Goenka puts it, your mind is like a wild monkey going from a branch to branch grabbing bananas and leaves. It’s also like browsing on the internet – you click on a link and then next, and next, and next…. it’s a never ending rabbit hole, I tell ya! Your meditation practice would help tame your wild monkey mind, he said. REALLY? Because it was really, really hard to shut off my mind for even a second. Many thoughts came up while sitting. A lot of them were really intense thoughts of anger and fear. And I felt worried about having those thoughts (i.e.”Wow, am I ok?”) and continued to let go of those thoughts. Because I was feeling such intense feelings during the meditation, I had nightmares almost every night and woke up scared in the middle of the night. I understand why students are asked to stay for the entire 10 days. I would’ve been kind of a mess if I left without having some kind of a closure for those intense feelings I felt. There is so much to say about the practice, and I think you need to go through it to really experience the impact of it yourself (or you may find it doesn’t have a lot of impact for you). What the practice taught me is to realize nothing is permanent, pain or pleasure, and holding on to them only creates suffering for you. It was really powerful for me to realize that only I can make my problems go away. 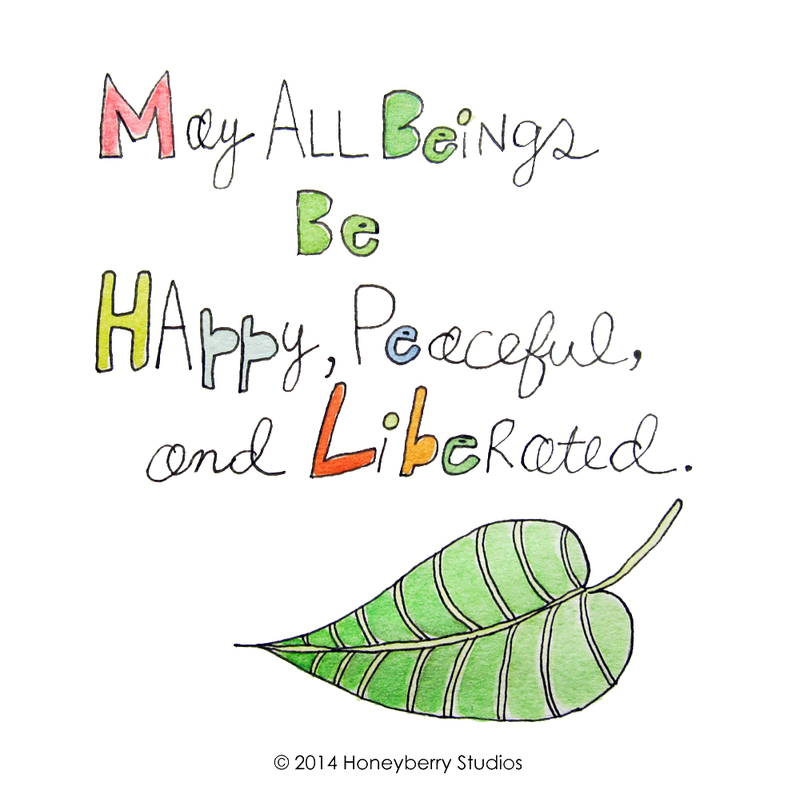 It is such a simple message, and it was so empowering and deeply healing for me. At the end, we learned the Metta Meditation, a.k.a. “Loving Kindness Meditation,” which may be my favorite part. In this meditation, you will learn to send all kinds of positive, loving, warm thoughts to yourself, your loved ones, your enemies, and all beings in the universe. What could be better?? After returning from the retreat, I was following their recommended daily practice of 1 hour meditation in the morning and 1 hour in the evening. It was a really hard commitment to keep, and eventually I stopped when my life got kind of crazy last summer. Despite that, I’m still able to go to that quiet place in my mind when things are stressful or hard even for a short time. It was truly a life-changing experience for me, and I would recommend to anyone who is interested! You can find more information about the Vipassana retreat here.